Language Translation Contribution in Python; VirusTotal Hash Check Plugin in Java. TL;DR: see below for a language translation contribution in Python, and a VirusTotal hash check plugin in Java. With JEB 2.3.6, users can now write their own unit contribution plugins in Python (or Java, of course). First, let’s recap: JEB extensions consist of back-end plugins, and front-end scripts. Front-end scripts are written in Python and execute in the context of a client (generally, the UI client, but it could also be a script executed by a headless, command-line JEB client). Back-end plugins form a more diverse realm: they consist of parser plugins (eg, disassemblers, decompilers, decoders, etc. 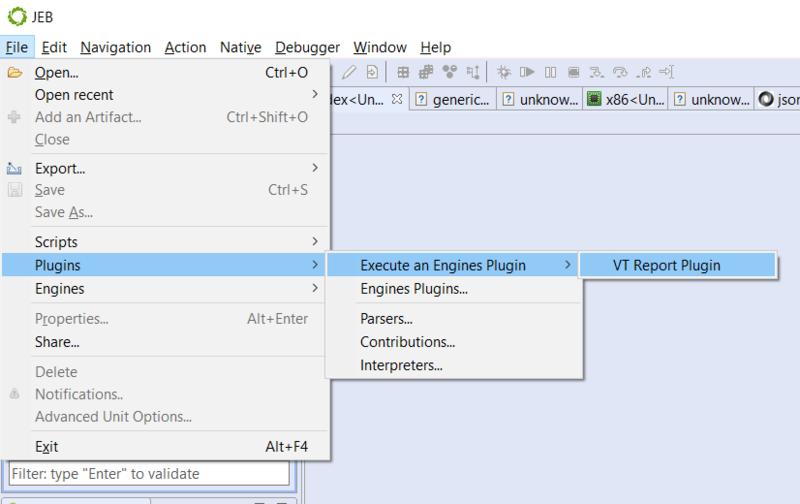 ), generic engines plugins, and contribution plugins. They are mostly written in Java – although that is slowly changing as we are adding program-wide support for JEB extensions in Python. Contribution plugins can enhance the output produced by parser plugins. A concrete example: an interactive disassembly or other text output (eg, a decompiled piece of Java or C code) is made of text items; a contribution can provide additional information to a client about a given item, when the client requests it. When it comes to the main JEB UI client, that information can be requested when a user hovers its mouse over an interactive text item. 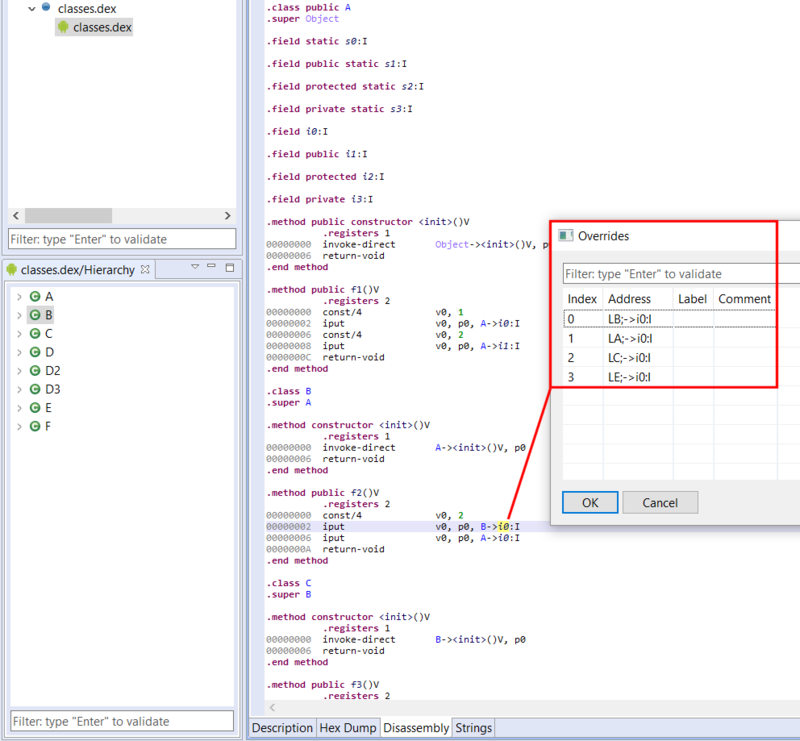 Several contributions are already built-in, such as those providing live variable and register values when debugging a program; or the Javadoc contribution that displays API documentation on Java disassembly. Users may also write their own contributions. The translation contribution translates foreign language text items to English when the user hovers their mouse over them; here, an Arabic string found in a malware sample of Mirai is being translated. Note that you do not need a Google API key for it to work: the plugin scrapes Google search out; as such it is quite brittle and will almost certainly break in the future, but keep in mind this is a demo/sample to get you started for your own contributions. 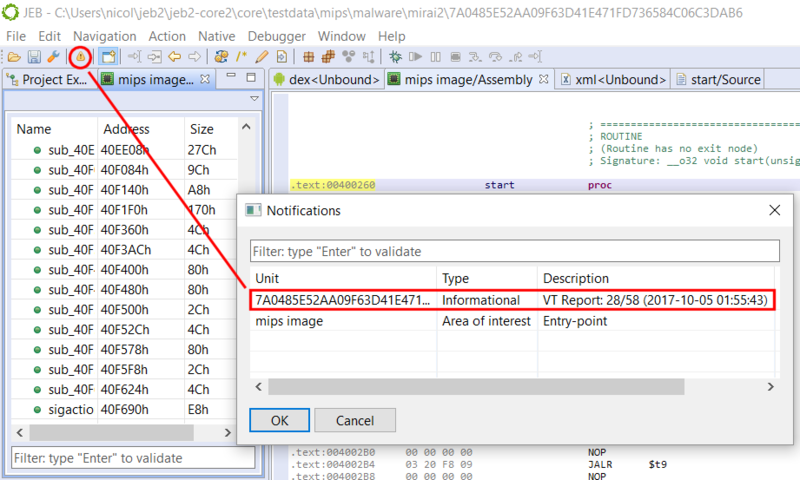 On a side-note, JEB 2.3.6 also ships with a VirusTotal hash checker plugin (disabled by default). This plugin automatically checks the hash of top-level units against the VirusTotal database. We open-sourced it on GitHub (VirusTotalReportPlugin.java). 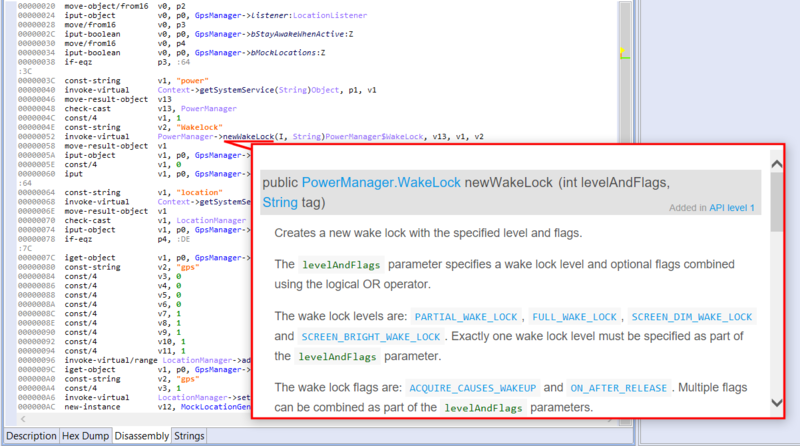 To set up the VT plugin, you will need a VT API key. Then, enter your VirusTotal API key; you’re good to go. Newly processed files will be automatically checked against VT and a log message as well as a notification will be stored to let you know the outcome. That’s it for today — until next time! Posted on October 18, 2017 Author Nicolas FalliereCategories API (JEB2), JEB2Leave a comment on Language Translation Contribution in Python; VirusTotal Hash Check Plugin in Java. 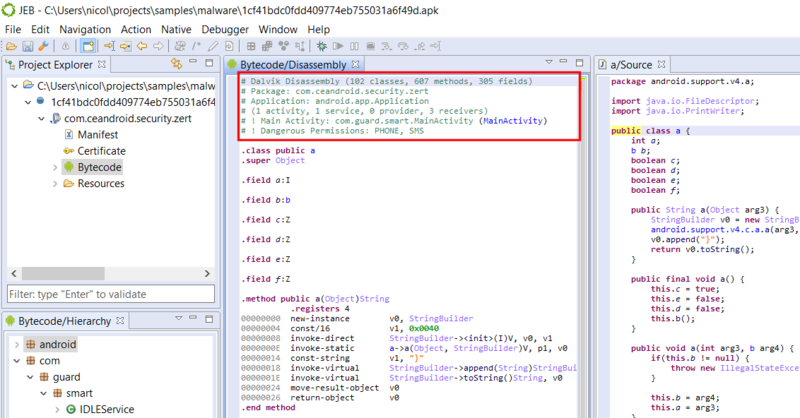 We are very excited to announce that JEB 2.3.6 integrates with a new project we called the Malware Sharing Network. It allows reverse engineers to share samples anonymously, in a give-and-take fashion. The more and the better you give, the more and the better you will receive. In exchange for their contributions, users receive more files, based on their score. The goal is to offer a platform for reversers that can (and wish to) share malware files to easily do it, with the added incentive of receiving samples in return — including relatively high-value files that may not be accessible to most users, such as files that are not publicly downloadable on most malware trackers; or files that are not present on malware databases at all, including VirusTotal. Obviously, the service is entirely optional. Any user, including users of the demo version, may use it whenever they please. The latest JEB update will let you know about the Malware Sharing Network right after you upgrade. You may also click the Share button in the toolbar at any time to get started. Sharing a sample is easy! First time users should create an account. You will only need an email address and a password. 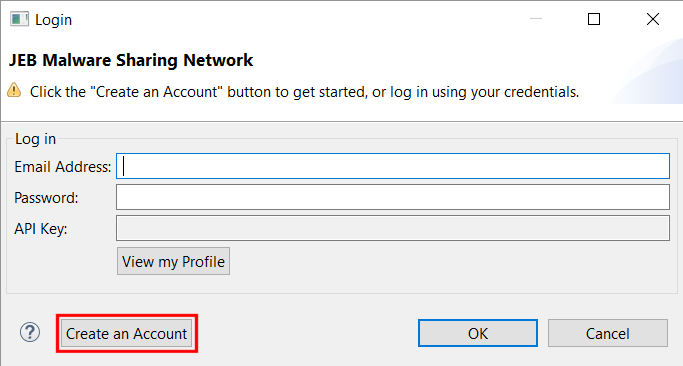 Click the “Create an Account” button to sign up. Once you’ve successfully logged in, you will be able to view your profile. Things like your sharing score and other stats are displayed. select a Determination, among four choices (“Unknown”, “Clean”, “Unsure” and “Malicious”). By hitting the Share button, you will submit the file to PNF Software. It will be added to our file portal, get scored, and eventually, be shared with other users who are participating in this sample exchange program. 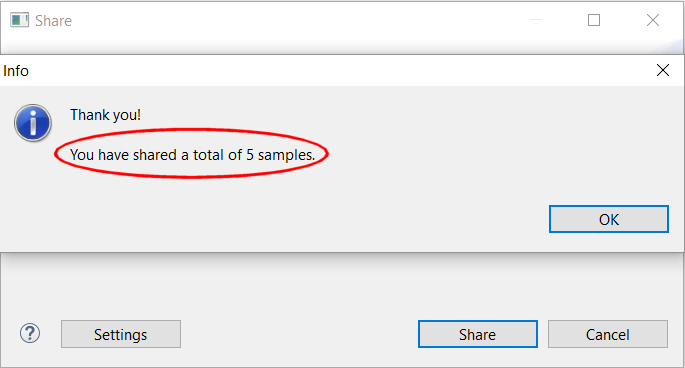 When your score gets high enough, you will receive samples. They will be accessible from our website, and also, using the Malware Sharing Network back-end API. After successfully logging in, you may have noticed that the API key field was populated. Power-users will be able to use it to perform automation and scripting with our back-end, such as querying samples by hashes, uploading and downloading files, etc. It’s all standard HTTP-POST queries with JSON responses. A Python wrapper to issue simple API queries can be found on our public GitHub repository. First make sure to set up your API key (either in source, or create an environment variable JEBIO_APIKEY, or pass it as a parameter if you are importing the script as a library). Queries return JSON output, except for download requests, that return binary attachments. The return “code” variable is set to 0 on success, !=0 on error. Note: the userdetails section is present only if you uploladed the file yourself.